You can play a lot of music on guitar simply by memorizing five major scale patterns and the best way to memorize anything is to practice. The following practice exercises will help you to learn major scale pattern #4. Patterns #1 and #2 had a range of two octaves, going from bottom to top. 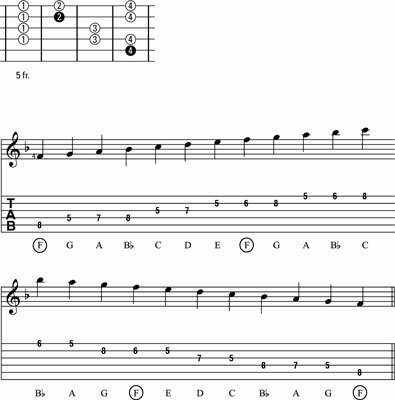 Major scale pattern #4, on the other hand, spans a bit less than two octaves. Playing just a single octave may seem a bit short, so in these patterns, as well as other patterns that span less than two complete octaves, we go as high as the position will allow. Major scale pattern #4 begins and ends on the 5th string. This time the starting finger is the 4th finger. The good news is that this position has no out-of-position notes (hooray!). So if you feel up to it, you can play the exercises using major scale pattern #4 with a little more brio (that’s music-speak for speed) than the patterns that require stretches. The following figure shows major scale pattern #4 in the key of F major in both a neck diagram and in music and tab format. Because this pattern is in the middle of the neck and has no out-of-position notes, you may want to jump right in and play a little faster. Whenever you try an exercise a little faster than you normally would, take a moment to prepare. Then play the entire exercise completely. Don’t get into the habit of making “false starts,” which is an indication that your fingers are ahead of your brain! When you’re ready, try the following exercise in rhythm. This figure shows major scale pattern #4 in the key of G major in 7th position. This exercise is an easy one. It’s up the neck (where the frets are nicely snuggled together for comfortable playing), it’s in eighth notes (which are a little easier to play than triplets or sixteenth notes), and there are no out-of-position notes to stretch for. So try playing this exercise fast from the get-go. You might surprise yourself by playing a lot faster than you think you can. Just be sure whenever you play fast that you don’t rush (or play ahead of the tempo). When something seems easy, it’s tempting to keep accelerating until you reach your limit. But you have to stay with the tempo established at the outset.